Give children a head start in school! This colorful, fun-filled workbook is designed to reinforce skills through engaging activities. With more than 100 curriculum-based pages—arranged in a progressive, 10-week format—targeting handwriting, alphabet and number recognition, reading, phonics, math, and more this book will help prepare preschoolers for kindergarten. 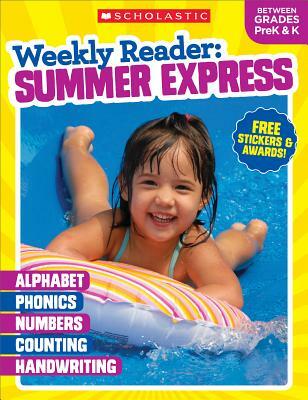 A summer’s worth of great learning from the trusted editors of Weekly Reader! "This book is a great help for me in teaching our daughter at home. It helps me get her ready for Kindergarten and also helps her retain the information she is learning in Kindergarten. The pictures are colorful and eye-catching - she was drawn to the book when she saw it. And the activities seem fun for her, for the most part. "Our daughter is 3, going on 4, and headed to her second year of Pre-K next year. We were looking to continue to challenge her throughout the year, and prepare her for another year of Pre-K with reading and writing. We've been very pleased with these books. - Varied activities - from circling items, to writing, to finding things in pictures, she's challenged in many different learning styles and activities. - She loves the stars at the beginning of each chapter. Each week, she gets a card full of sticker stars, and every day, she gets to affix her new stars to her chart. - She can do these by herself, with minimal oversight / instruction. Most things are pretty clear. - Some of the challenges are too easy or too hard for her. I think overall, the skill level is right, but she's a year young for this, so that may play into it. "This is perfectly suited for ages 4-5. For kindergarten prep, your child will be well ahead of the class. These activities are terrific. The pages rip out if you want. They are numbered with a calendar, so you can do 2 activities per day (1 sheet, front & back) for 10 weeks. Enough for the summer break. But frankly we do about 5-10 exercises per day (sometimes a whole weeks worth in 1 day), so for us they go fast. The star stickers are great - you get one star every day on the calendar, and little certificates when you complete a week. Really well designed, love them. Great gift idea if you're a grandparent. The first few pages are a bit simple, but they get more challenging just a few pages in. I only wish they made more than one book per level because we are going through it so fast..
"We absolutely love this activity book for our toddler son. Not only it makes learning a fun experience with colorful and fun-to-do activities with handy tips for new parents like us on how to make it engaging for your child ..But it also makes it a rewarding and something to look forward to for your child with its reward based teaching methodology with daily Star stickers that have to be earned, Weekly completion certificates and a grand 10-Week course completion certificate. Our son is so proud of them & shows them to our visitors !